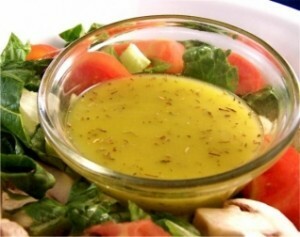 The most common dressing for salad is vinaigrette. A vinaigrette is acid and oil, combined; every other addition is up for grabs. The acid may be freshly squeezed citrus juice, usually lemon or lime, or vinegar — the best you can find. The acidic ingredient is the most basic flavor of a vinaigrette, so it should be delicious. The oil, most often olive, may be a nut oil or a neutral vegetable oil. Oil can add to a vinaigrette or it may be nothing more than a carrier of other flavors. Extra-virgin olive oil, walnut oil, and peanut oil are examples of strong, delicious flavors that can boost a vinaigrette. “Pure” olive oil, canola oil, and grapeseed oil are examples of neutral oils that add little besides body. Rancid oils, no matter what their origin, can ruin vinaigrette. Smell oil before adding it to avoid this; you’ll know when its taste will be negative rather than positive. Aside from added flavors, there are two major determinations to make whenever you make a vinaigrette, and they are both based on personal taste. First, you must decide the ratio of oil to vinegar; second you must decide whether to emulsify the dressing. The first question cannot be answered routinely. Lemon juice measures three or four percent acid; strong vinegar measures twice that. If you use the same amounts one dressing will be twice as strong as the other. Similarly, some oils are much stronger-tasting than others, and seem better at balancing acidic flavors. What you can do is determine your general personal preference and work from there. I recommend starting with a ratio of two parts oil to one part vinegar. You may end up with three or even four to one; you may end up at one to one, especially when you replace the vinegar with lemon juice. (You may even prefer more vinegar than olive oil; there’s nothing wrong with that.) But try to get a sense of the ratio that you prefer, and use that as your starting point. Then taste, taste, taste. As for emulsifying, it’s purely a matter of choice. Traditionally, vinaigrettes are an emulsion of vinegar and oil, and emulsions are creamier, and marginally more pleasing texturally, than vinegar and oil separately. Having said that, it’s worth noting that drizzling a salad with olive oil and vinegar or lemon juice is not only a good alternative tradition, but one that gives you a chance to adjust the ratio of oil and vinegar while you taste the dressing with the greens. Although it’s always possible to make a good-tasting vinaigrette, you cannot always predict how it will taste when tossed with greens. But if you drizzle olive oil and vinegar over a bowl of greens and toss, it’s easy to adjust the taste by adding more of one or the other. Should you decide to emulsify, you have several choices. Both food processors and blenders — whether the more common stand-up type or the new immersion variety — make perfectly emulsified vinaigrettes. These emulsions are stable for hours and sometimes longer, so they’re especially nice for buffets. You can also simply whisk the oil into the vinegar and seasonings, or shake everything together in a jar. These emulsions are less stable, but fine for dinner or other occasions when longevity is unimportant. A spoonful of Dijon mustard not only boosts the flavor of many vinaigrettes but makes emulsions even more stable. Vinaigrette is best made fresh, but some versions store well enough for a few days in the refrigerator, covered tightly.